Joe is more than 80 years old now, but he is still pained to think of what happened when he was just a teen. A frail, slightly bent man, Joe is the recipient of numerous professional association awards. A man who made his career in Civil Engineering, a man who tells me, to my surprise, that he was taken prisoner by the Japanese during World War II. We talk in the hallway of the hotel, near the ballroom. It is time for cocktails as the guests arrive for the banquet that is part of the annual spring conference. Idle chatting turns solemn. Joe, I tell him, it’s good to talk about these things. You should be proud of your service. You did your duty, I say. And you should talk about what you went through to honor those that didn’t make it and to educate young people about the sacrifices of war. You did your part, and you should be proud for what you and all those other guys did. He nods, but I am sure he is not convinced. We talk of the National World War II Museum in New Orleans, how they are working to document the stories of his generation—before they’re all gone. He finally admits that someone from the museum recently did get him to talk. She came by his office with a video camera and taped about three hours of his war memories. Joe says she was pretty. I laugh. You dirty old man, I say, so that’s what it takes. It was his fifth landing that was the worst, he says. They told him there would be little resistance. They told him there would only be a hundred or so Japanese on the island they attacked that day. There were 9,000. The Japanese thought Joe knew something about the Navy’s special ordinance. Joe says he thinks that’s why they didn’t kill him. That’s certainly why they tortured him. Joe survived more than a year in their brutal hands. “They used to wake us up before dawn by jabbing us with bamboo sticks,” Joe recalls. “Then one day, the sun was up, and nobody came to get us.” He hitched a ride with an Aussie soldier on a battered personnel carrier all the way to Singapore. After more than a week, he arrived and found a Navy Destroyer anchored in the bay. They told him the news. The Japanese had signed a treaty of unconditional surrender. It was September 1945. Joe’s eyes glisten as he speaks, but he manages not to cry. So many years ago, and yet so clearly near to him. “Hey, this is supposed to be a party!” he says suddenly. Yes, let’s go get another drink, I tell him. You deserve it. I’m in Shreveport for an ASCE conference. The people here don’t seem to have many tatoos, and nobody speeds up when the traffic light turns yellow. Everybody here addresses me as “Sir.” The hotel bar closes at 10pm. It really is a nice town. But damn, I miss New Orleans. I just added a new link to my sidebar. A big button of a hand emerging from the flood. The hand is holding a banana, the logo many will recognize as that of Tipitina's music club. The link is for the Tipitinia's Foundation, a non-profit organization for musicians that pre-dates Hurricane Katrina. They could use a donation if you can spare a few dollars. You can give online with a credit card, or you can send it by snail mail. Either way is fully tax deductible. There's been a lot of noise about people who want to save the musical culture of New Orleans, but unfortunately some groups that are saying they are here to help the artists really aren't making much impact. Tipitina's Foundation is different. They had already given away more than $200,000 of instruments to local schools prior to the wretched hurricane season of 2005. They've ramped it up considerably since then, so you can be assured that every dollar you give gets to where it's supposed to, and that every dollar has an impact on this city's music. Click it and rebuild the music culture of New Orleans. One of the first new neighbors we met when we moved to Vista Park was Al. He lived on the next street and we shared a backyard fence. But that was no barrier to Al--he was quick to introduce himself over the six-foot fence one afternoon. And he was quick to tell us about his Tree House. It turned out that Al was a civil engineer, too. At the time, I was on the board of the New Orleans Branch of the American Society of Civil Engineers. Al had been on that board, too, and had served as the first elected president of the local ASCE almost 40 years prior. "Small world," as they say. Now retired from engineering, Al can point to buildings all over the greater New Orleans area and say, "I worked on that project." Some large, some small, some famous, some infamous. One example: Al worked on the bomb shelter--the civil defense bunker buried in the dirt of what used to be the new basin canal. And Al has worked on some prominent projects that are far from here, too. For instance, Al was the structural engineer for the US Embassy in Saigon and a sewerage treatment plant in Nashville, Tennessee. Yet as many projects as he's designed or been part of, the one he seems to enjoy talking about most is the Tree House. Standing about 12 feet tall in his backyard, the lanky structure isn't all that pretty at first glance. And truth be told, it isn't even a bona fide tree house. It stands on four telephone-pole legs with a green corrugated plastic roof and a single deck about 6 feet above the ground. The sides of the deck are fully enclosed to rail height. Access is through a trapdoor and a rope ladder. Inside, there are benches along two sides. I will never forget how Al talked about that Tree House almost from the get-go when we first met over the fence years ago. He was proud--bursting with pride would not be too strong a description--of the backyard Tree House he built for his children. The story starts in 1962. That’s when Al moved to Vista Park and soon after built the Tree House. In 1965, Hurricane Betsy came to town. And although Betsy battered houses throughout the area with winds in excess of 100 miles per hour, the Tree House stood tall. Well, actually, it did lean a couple degrees to one side, but otherwise no damage. Not long after that, Hurricane Camille delivered hurricane-force gusts, too. Again, the Tree House withstood it all. Al and his wife raised 3 children in that house: 2 boys and 1 girl. They all played in the Tree House at one time or another. According to son Mark, during his childhood the Tree House was everything from the ramparts of Fort Apache to the bridge of the starship Enterprise. Those four poles lifted not only a minor structure; they hoisted the imagination of Al's children over many years of safe and creative play. And it has brought no small amount of joy to Al, too! Fast forward to 2005. Hurricane Katrina whips through the city and undermines the levees near our homes. Al's children are all grown and on their own, although his daughter Jan still lives down the street from us. Their house flooded and in need of major repair, Al and his wife make their new residence north of New Orleans on the relative high ground of Pontchatoula. They put their house here up for sale. 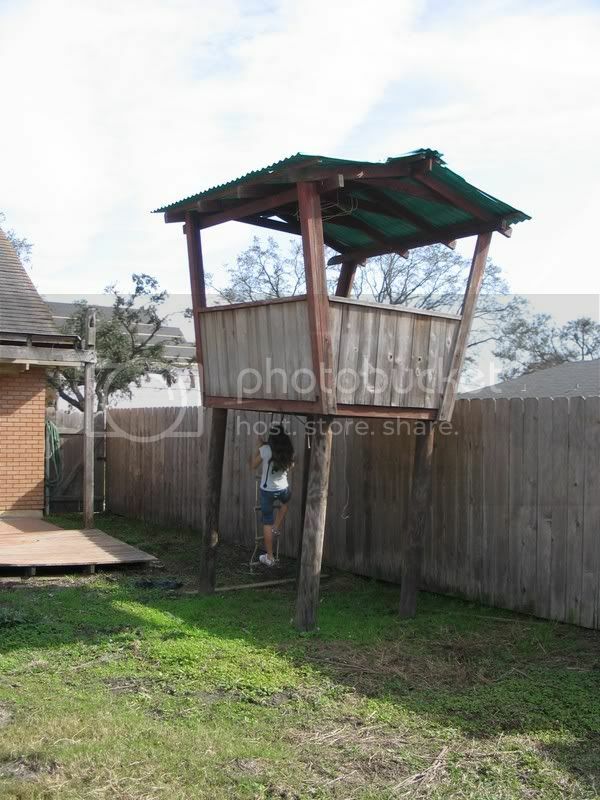 But, as it weathered every hurricane before, the Tree House remains intact. Al’s son Mark lives far from New Orleans now, but they were looking forward to visiting one day soon. 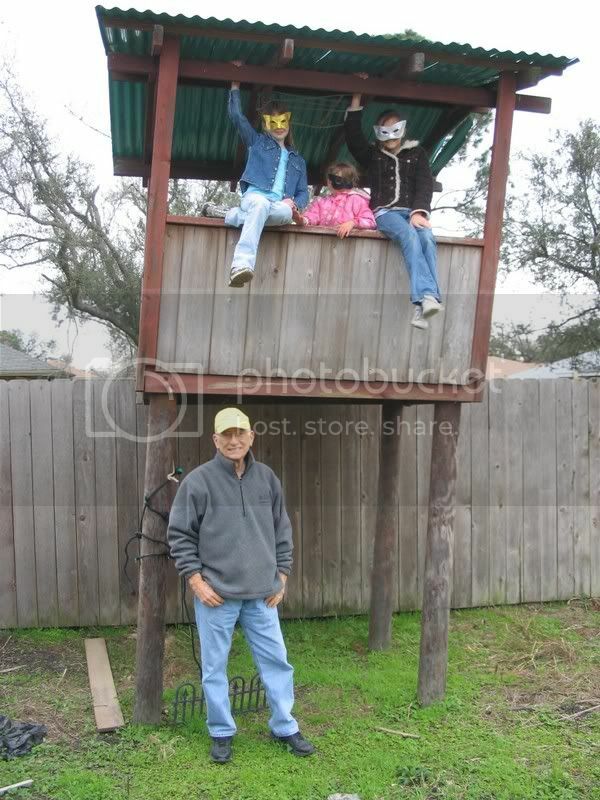 Al wants to show his grandchildren the Tree House where their dad used to play. Katrina interrupted that plan. “Maybe some day,” Al tells me. We demolished our house and what was left of the fence, too, so that now when we step out of the FEMA travel trailer, we see the back of Al's house and the Tree House. No surprise, my Precious Daughter wanted to go play in it. We hesitated at first, but I emailed Al and he granted us unlimited access. Soon, our Precious Daughter was sweeping and cleaning and bringing potted plants up the ladder. The Tree House is now a regular feature of her play time. When her friends visit, they pack a snack and bring games and dolls with them up to the Tree House. A few weeks ago, Al stopped by the house while our girl and her friends were playing Mardi Gras parade and throwing beads from the Tree House. I made Al pose for this picture. And you know, now that I think about, I guess I understand why Al is so proud of that Tree House. The Times-Picayune printed an Op-Ed I wrote in the Saturday, March 3 edition. I don't know why but it does not appear to be available online. It was adapted from my column recently published in The Louisiana Civil Engineer, the official journal of the American Society of Civil Engineers Louisiana Section. Here is the original version of what I submitted to the TP. Update: It is now available online here. There is an enormous amount of work being done right now on the hurricane protection system in the New Orleans area. Under orders from congress and the president, the Army Corps of Engineers is designing levees to meet the requirements of the National Flood Insurance Program (NFIP). That is, levees to provide a so-called 100-year level of protection. This is a mistake for two important reasons. First, I would argue that a 100-year level of protection is not an appropriate level of safety for densely populated, highly developed areas. Second, the terminology employed is easily subject to misinterpretation, giving a false sense of security to residents that may in fact cause more harm. The National Flood Insurance Program (NFIP) selected the 100-year event as its benchmark. They use it to establish Base Flood Elevations and as the basis for the insurance they provide for buildings and contents. What the so-called 100-year event really means is there is a 1 percent chance that the design capacity will be exceeded in a given year. Engineers refer to this as the probability of annual exceedence. A 1 percent chance may sound like good odds to the layperson, but engineers and scientists know better. That’s because as years go by, we know the odds get worse because the probability of exceedence accumulates with each year. So while there may be a 1 percent chance of seeing a damaging flood in any single year, the probability snowballs over many years. The laws of probability tell us that the risk of experiencing an event exceeding the 100-year level of protection over a 30-year period is a whopping 26 percent. In the long run then, we can expect more than one out of four homes with the 100-year level of protection to be flooded within the time span of a typical mortgage. And the chances get worse each year. From the property insurance perspective of the NFIP, we might be able to justify the financial risk of building and maintaining development exposed to such peril. From a life-safety point of view, the risk would certainly be unacceptable to society—if it were properly described. This leads to my second argument against the 100-year level of protection: the public is misled by the terminology and so does not understand the statistical implications of a 1 percent probability of annual exceedence. A lot of people misinterpret the “100-year” terminology to mean “once in 100 years,” and you could not fault them if they did so. As just shown, however, that is not at all what it means. I have no doubt this misunderstanding of the risk of flooding encourages inappropriate development such as slab-on-grade houses. Worse, I suspect it may influence people’s decision to evacuate or not. Anyone who thinks, “It only happens once in a hundred years,” may decide to stay when the next hurricane comes—with potentially deadly results. As an engineer obligated and dedicated to protecting the public, I am greatly concerned that we have learned little or nothing since 2005. Policymakers need to understand that the hurricane protection system does not simply protect property—it safeguards lives, too. Levees and other components of the hurricane protection system must be considered life safety features and should be designed, constructed and maintained with appropriate diligence. Everyone living and building in the New Orleans area must understand that flooding can and will happen, no matter what their NFIP flood zone classification. Elevation to the BFE must be required, and additional elevation above the BFE should be strongly encouraged. We’re all eager to rebuild New Orleans and revive the entire area. But our leaders must be honest and open about the risks of living here, and work to properly describe those risks. The hurricane protection system should not be designed simply to satisfy the requirements of an insurance program. It must be designed, built and maintained with full realization that it protects lives—thousands and thousands of lives. To do less would be unconscionable.